Posted: Friday, September 30, 2016. 10:14 am CST. Posted: Friday, September 30, 2016. 10:13 a.m. CST. By BBN Staff: Hurricane Matthew is rapidly strengthening in the Caribbean sea. This morning Matthew became a Category 3 Hurricane with maximum-sustained winds of 115 mph, according to the National Hurricane Center. It was moving to the west-southwest at 12 mph and was located 495 miles east-southeast of Kingston, Jamaica. 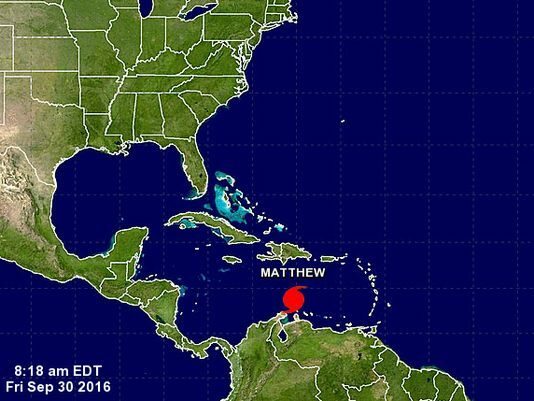 Matthew poses a dangerous threat to Jamaica, Haiti, Cuba and the Bahamas over the next few days. A tropical storm warning is in effect for portions of the coast of Columbia. Matthew has been classified as a ‘major’ hurricane when its sustained winds reach 111 mph. A major hurricane is a Category 3, 4 or 5 on the Saffir-Simpson Hurricane Wind Scale. Matthew is the first major hurricane in September in the Caribbean since Felix in 2007. Hurricane watches or warnings are likely to be posted in Jamaica, Haiti, Cuba and the Bahamas over the next few days. Even if Matthew turns toward the sea next week, rough surf and heavy seas would occur along the Atlantic coast.